After a long week, it can be hard to leave your stress and responsibilities at the office. That’s why you have to turn off the “chill beats” or “indie rock” on Friday afternoon and switch to music that gets you into the weekend mindset. Now, we aren’t professional DJs, but we know a good feeling when we feel it -- and these 11 tracks will definitely pump you up for a weekend’s worth of possibilities and adventure. 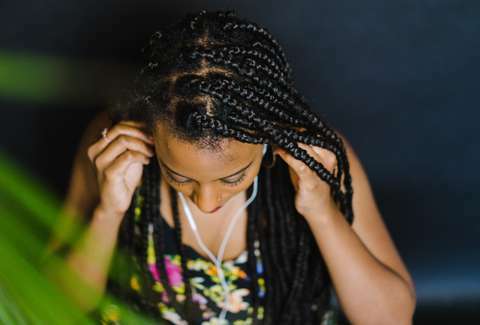 Whether you’re getting ready by singing into your showerhead or driving with the windows down, these songs are sure to leave the office in your rearview. For those of you shaking your head and wondering why we didn’t pick “Friday I’m In Love,” hear us out. Once you combine the drum-fill intro and catchy guitar riff with Robert Smith’s hopeless romantic lyrics, the weekend vibes of 1987’s “Just Like Heaven” are undeniable. See, there will always be a time in your life when the weekend means the possibility of finding love -- maybe at a college party, a bar, or one of the 15 weddings you have to go to that year. You just need to go into it with the right mindset. This is how you get there. Let’s get one thing straight: David Bowie’s 1983 funky disco smash is good any time, any place. But listening to it on a Saturday night makes it magical. “Let’s dance to the song they’re playin’ on the radio/Let’s sway while the color lights up your face.” When they hit you at just the right time, you have to wonder if these lyrics were plucked straight from your brain. The message couldn’t be simpler and the action couldn’t feel better: Forget your responsibilities and let loose. We might be constantly moving on from one Drake hit to the next, but “Started From the Bottom” is forever. No matter what kind of week you’re having, this 2013 single has the ability to reinvigorate you and usher you into the weekend. You’ve finally reached Saturday, and maybe you’re on your couch, or at the bar, or apple picking. It doesn’t really matter where “here” is -- just turn up the speakers and lean in. Make no mistake: This 2007 track from French electronic duo Justice isn’t just a song. It’s a full-on banger. From the second it starts, the earth-shattering beats make you feel like the weekend, if not the whole planet, is about to blow up. If you want to start your weekend off strong, this is the way to do it. Okay, this one is a little on the nose. SZA’s power ballad about three women dating the same man (“My man is my man is your man/Her, this her man too”) but one deciding enough is enough (“I gotta say I'm in the mood for a little bit more of that/I mean I'm saying what kind of deal is two days?”) becomes even more invigorating when set to a more upbeat tempo. If you choose to ignore the meaning, the funk and the fact that it says “weekend” 20 times is enough to make you forget all of your stress. If you choose to acknowledge it, well, what’s more energizing than recognizing self-worth? If you’re familiar with LCD Soundsystem’s (arguably) most commercially successful song, then you know why it made this list. If you don’t know it, listen until at least 3:05 when the beat finally drops. Fans have speculated the song is about a relationship ending (“Every night's a different story/It's a 30-car pile-up with you. Everybody's getting younger/It's the end of an era, it's true.”) but the song is relatable in even the smallest sense. By the end of a bad week, we all have something from which to dance ourselves clean. Maybe the most ‘80s song still regularly used on movie soundtracks, New Order’s most dance-worthy single still hits all the right notes some 35 years later, and is still the best-selling 12-inch single of all time. This tried-and-true dance floor anthem has the ability to turn your mood around in seven and a half minutes. Pretend you’re an extra in The Wedding Singer. Pretend you’re an extra in a cyberpunk movie. Whatever gets you in the zone. Listening to Prince to get into full-on weekend mode isn’t about a song or an album. It’s about the way he lived. Prince showed us how to be fun, funky, unapologetically yourself, and a little bit romantic at the same time. And all of those things happen to be perfectly displayed in 1986’s “Kiss.” If you need a little Saturday inspiration, look no further than His Royal Badness. Like Drake, we could have filled this entire list with Rihanna’s dancehall hits, but classics become classics for a reason. Between her voice, the track, and the sampling of “Mama-say, mama-sa, ma-ma-ko-ssa” from Michael Jackson’s “Wanna Be Startin’ Somethin’” -- this song was destined for far more than 2007 airplay. The weekend might feel low stakes, but when you think about just 48 hours to relax, have fun, find love -- do whatever it is you need to do before Monday -- we’re all right there singing the plea with RiRi. Sometimes you just need a good old-fashioned love song to disconnect from everything and put you in the mood for the weekend. “This Must Be The Place” is that song. There’s nothing more romantic than when David Byrne realizes in the titular verse: “Home, is where I want to be/But I guess I'm already there. I come home, she lifted up her wings/I guess that this must be the place.” You might not realize what the weekend has in store yet, but it’ll feel a lot like this when you do.